Start reading Smart Teams: How to Work Better Together on your Kindle in under a minute. With the constant noise of incoming email, packed schedules of ineffective meetings and lengthy projects with poorly-defined objectives, it is tougher than ever for teams to be truly productive. 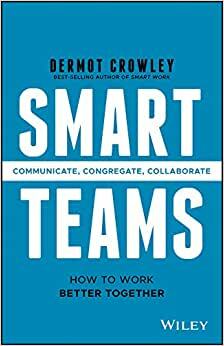 From productivity expert and best-selling author Dermot Crowley, Smart Teams shows you how to build a superproductive team culture with clear principles, simple steps and everyday actions. collaborate better to make projects more productive. Smart Teams shows you how to reduce the noise and implement the changes that will allow your team to flourish. DERMOT CROWLEY is an author, speaker, and the founder and director of Adapt Productivity, a leading training and coaching service in Australia. He is also the creator of the Smart Work program, linking productivity theory to technology. 4.0 out of 5 starsA common sense and practical book. A good book for a new young professionals, or a good refresher for someone with more experienced. Recommended to anyone seeking team productivity primers. Dermot Crowley is Australia's leading thinker and writer in the domain of productivity. His first book, Smart Work, taught us how to work productively in the digital age. Smart Teams is a breakthrough body of work that teaches us how to create cultures of productivity in our teams and organisations. Implementing the strategies around meetings will give you your life back, and the rest of the book will transform the impact of your team and business. Critical reading for anyone who wants their team to be more effective. 5.0 out of 5 starsGreat team book! Loved the book, full of practical insights that you can use with your team! Dermot Crowley is Australia's leading thinker and writer in the domain of productivity. His first book, Smart Work, taught us how to work productively in the digital age. Smart Teams is a breakthrough body of work that teaches us to create cultures of productivity in our teams and organisations. Implementing the strategies around meetings will give you your life back, and the rest of the book will transform the impact of your team and business. Critical reading for anyone who wants their team to be more effective. 5.0 out of 5 starsIt is a wonderful expose of the challenges we have created for team productivity. I have long admired Dermot Crowley's approach to productivity and immediately implemented his personal productivity methodologies when I read Smart Work. Now he has published Smart Teams. It is a wonderful expose of the challenges we have created for team productivity because of the way we work. While individual productivity is important, the sum is not greater than the whole at team level because of what Crowley calls "work friction". Friction caused by things like information overload, ineffective meetings and the constant distractions of a "must have now" mentality. Leaders would be wise to read Crowley's counsel in this book. It will give you strength to embrace the increasing complexity of the world we have created for ourselves.